Paul Holt has just completed his detailed trip report for the autumn migration trip to Laotieshan in Liaoning Province, China. It will come as no surprise to anyone who knows him (and me!) that Paul is responsible for the incredibly detailed daily counts of the species included in the report. It was an awesome trip with some stunning counts (including some China records). Over 1600 bird-days of Black-faced Bunting with a peak of 700 on the 8 October. Several early Alpine Accentors with sightings on three dates after the 11 October. I visited Wild Duck Lake on Sunday with Peter Cawley. The weather was far from ideal and we endured thick fog, with visibility down to around 20-25 metres, for the first few hours. The fog gradually dispersed from around 1000am and, by 3pm, it was a glorious day.. nevertheless, we definitely missed out at what felt like a very ‘birdy’ Ma Chang and, rather unnervingly, almost got lost in the ‘desert’ area… (thanks to the GPS on my phone, we found the right path). Temp around 15 degrees C at 0600 with thick fog and no wind. From 1000am a very light NE breeze. Temp around 22 degrees C mid-afternoon. Highlights: a single Short-toed Eagle, Pied, Eastern Marsh and Hen Harriers, 30 Common Buzzards, Goshawk, 2 Mongolian Larks and a Wren (only my second at Wild Duck Lake). 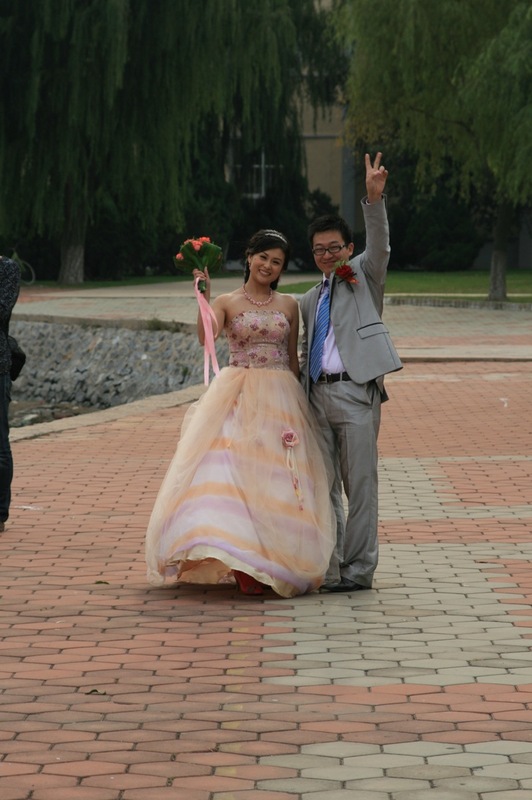 Mongolian Lark – 2. An early date and hopefully the precursor to a good winter for this species. 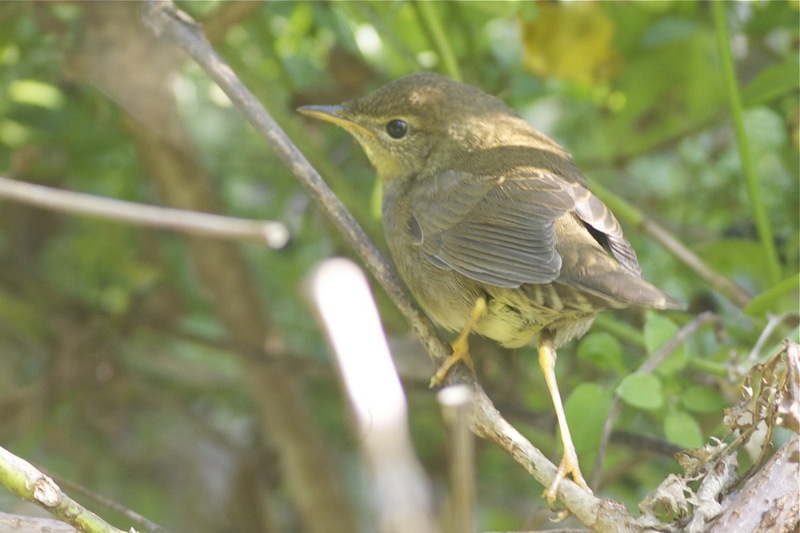 Oriental Reed Warbler – 1 probable chattering at Ma Chang in thick fog. Wren – 1. A very dark individual. 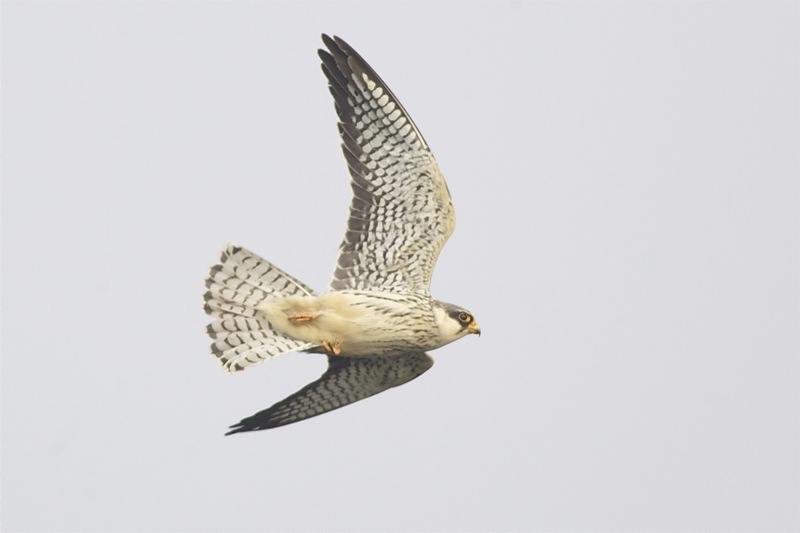 Meanwhile, at Laotieshan, Paul Holt continues to see huge numbers of Amur Falcons (over 1,800 yesterday evening in a pre-roost gathering – the highest autumn count anywhere in China), good numbers of Greater Spotted Eagles (at least 7 and up to 17 yesterday) and Goshawk (64), over 250 Common (Eastern) Buzzards and has also added Japanese Reed Bunting to the species list. 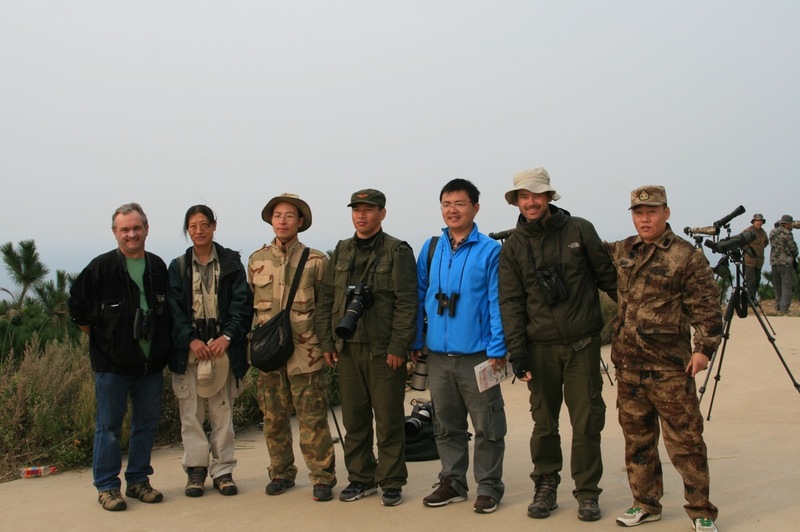 After the disappointment of being kicked off one of the prime raptor migration watchpoints on Tuesday, we took up the invitation from the local reserve officials, introduced to us by the Beijing Birdwatching Society, to visit a ringing station at Laotieshan. Our hosts, Mr Wang (Head of Research) and Mr Zhang (a researcher and ringer) met us near the lighthouse car park at 0630 and drove us to the ringing station where we met with two more staff. 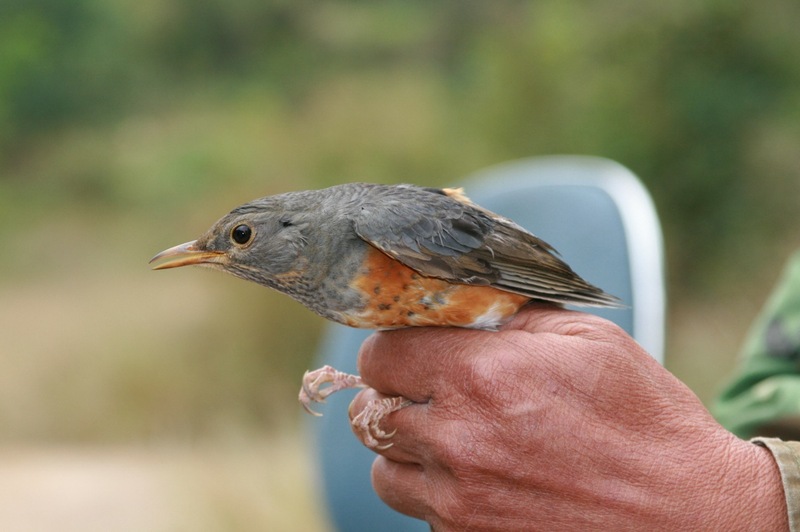 At this site (one of 8 ringing stations in the area), they operate four mist nets, three of which are targeted at passerines and one at raptors. It wasn’t long before the resident bird-catcher, Mr Sun, appeared with some birds and we were pleased to see Grey-backed Thrush and Tristram’s Bunting in the hand. These birds were ringed and released promptly and soon we were discussing the birds of Laotieshan and the various species they had ringed. They gave us each a book that covered the birds of the Laotieshan peninsula and the nearby Snake Island (the island featured in the BBC series, Wild China, where the Pallas’s Pit Vipers have evolved to climb trees to wait for unsuspecting migrant birds). The list makes for very interesting reading, giving the status of each bird at Laotieshan – resident, summer visitor, winter visitor or passage migrant. I’ll post a translation of it on here at some point. 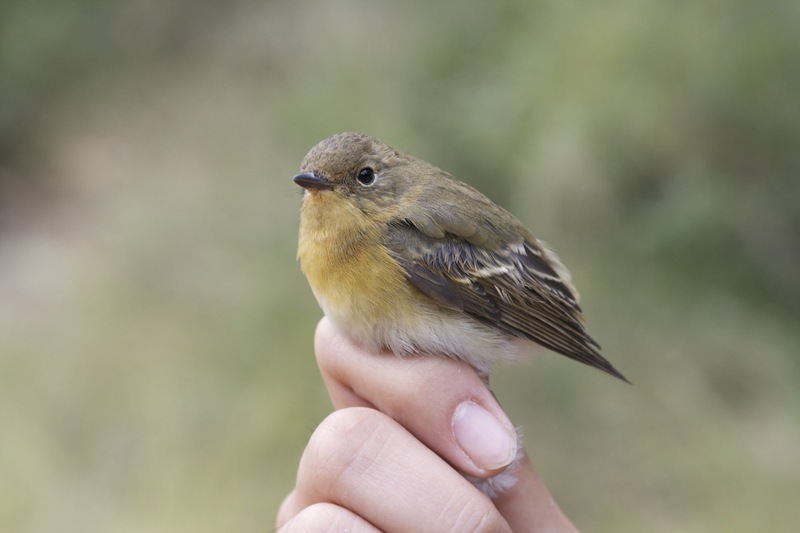 During this discussion Mr Sun disappeared, then reappeared with a Mugimaki Flycatcher.. a nice trick! Unfortunately this bird had lost its tail, either in the net or in the bag, but nevertheless, it was a smart bird. We asked about access to Snake Island. Officially there was no access unless one had a permit (a familiar story in China!). Mr Wang was due to go out there later that day and stay for a week, part of the rolling wardening duties on the island. Mr Zhang told us that Mr Wang was once bitten on the finger by a Pallas’s Pit Viper and spent the next three months recovering in hospital.. ouch. Mr Sun appeared again, accompanied by gasps from the audience.. this time he held single Tristram’s and Black-faced Buntings. Mr Sun proudly showing off a very smart Tristram's Bunting. I was impressed with the professionalism of these ringers, especially after some of the horror stories I had heard about ringing stations at other locations in China. The volume of birds being caught here was not high – they said that, on average at this time of year, about 30 birds were caught each day – but the quality and variety was good. We accompanied Mr Zhang on a walk around the nets and discovered over 20 Chestnut-flanked White-eyes together with a single Radde’s Warbler and another Tristram’s Bunting. 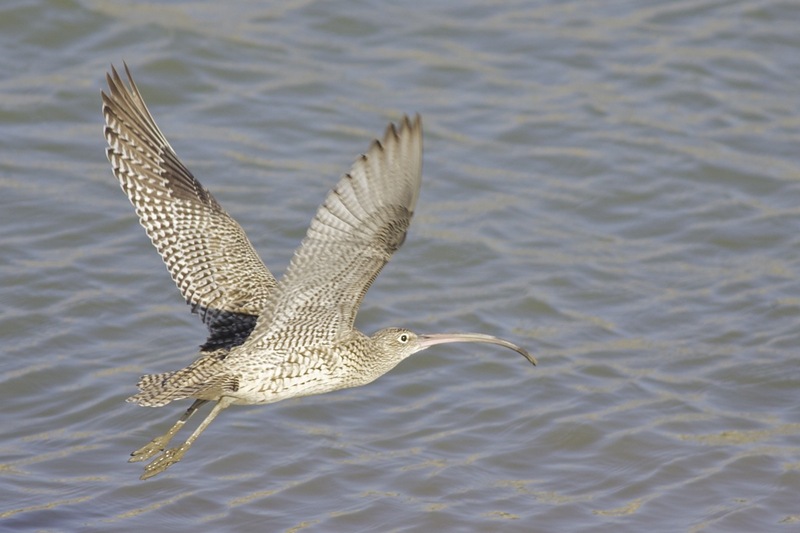 It took us some time to help retrieve these birds from the nets but they were promptly ringed and released. 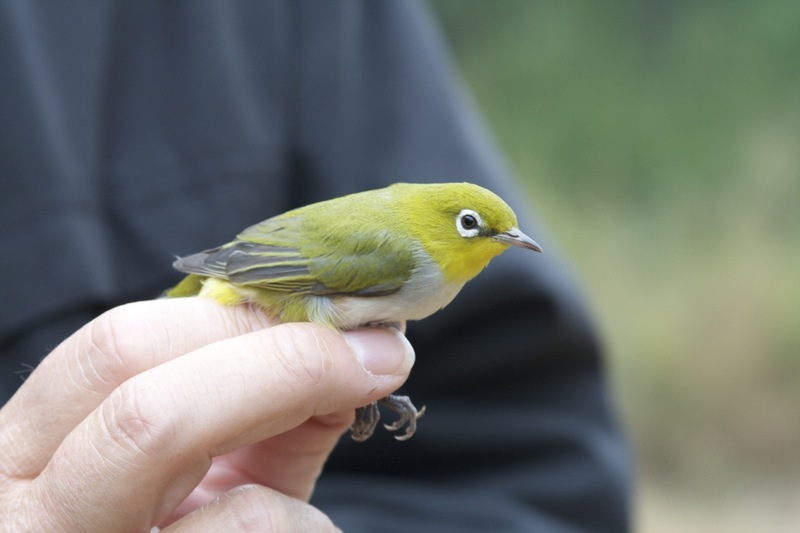 White-eyes have been a big feature of our time at Laotieshan with thousands passing through… they are full of character and it was interesting to see some in the hand. Chestnut-flanked White-eye. One of over 20 caught and ringed on 5 October at Laotieshan. 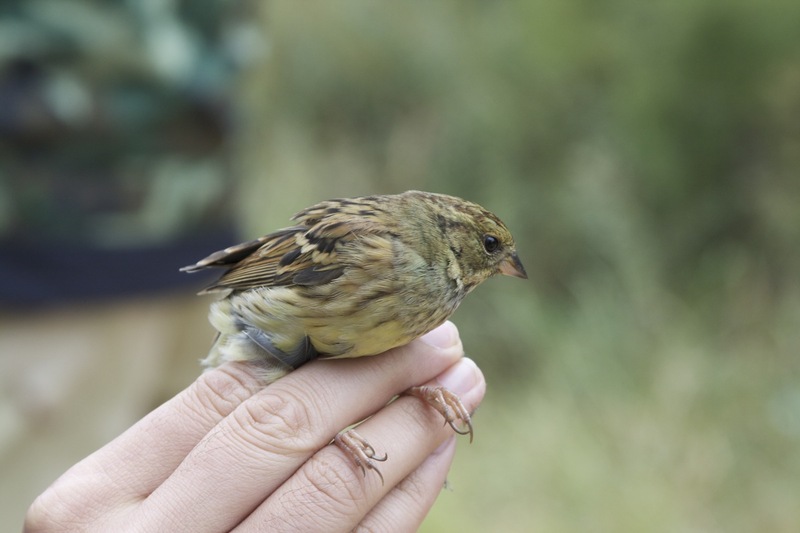 A major part of the work of the ringing station is to try to stop illegal bird trapping. This is a traditional activity at Laotieshan that has been ongoing for many years and, therefore, is not easy to eradicate. Every day the staff explore the ridges for illegal nets, cut down any they find and also report any individuals they see to the police. 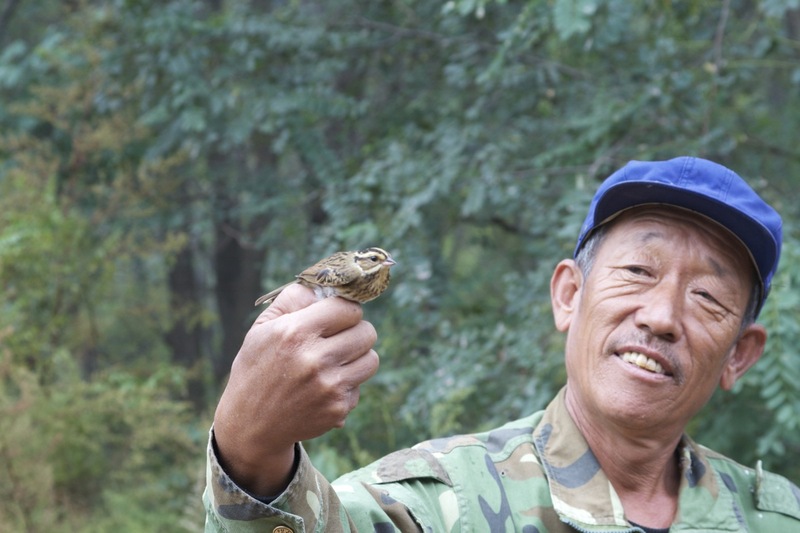 One guy told us that the illegal bird trappers used to catch around 4,000 raptors each year at Laotieshan (!). This has significantly decreased due to the work of the reserve staff but they told us that it is still common to find illegal mist nets. 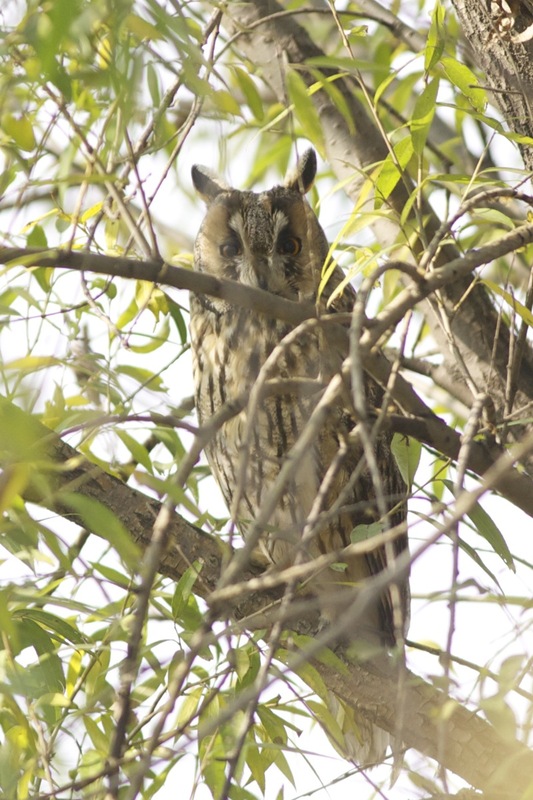 One event that they are proud of ,and that they hope will act as a major deterrent to others, is the fact that, last year, one guy was apprehended with a haul of Oriental Scops Owls and was given a 10-year custodial sentence! 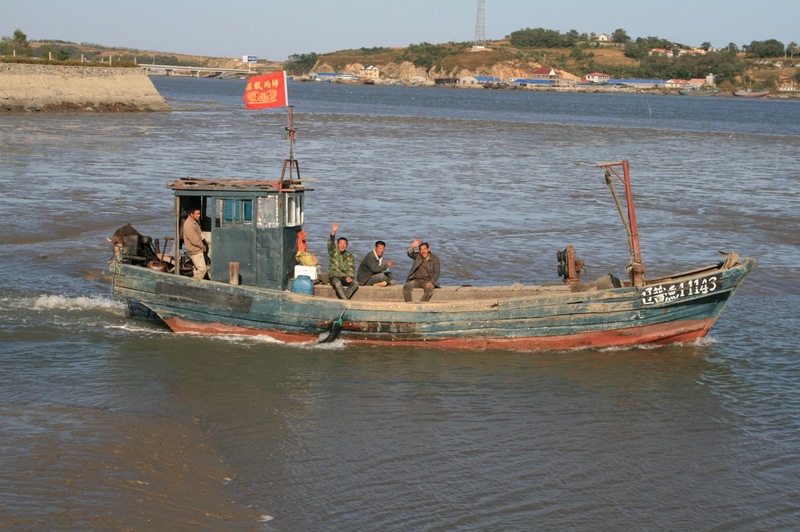 I had read about this story in the China Daily last autumn and it seems as if this has acted as a warning to the locals.. Mr Zhang said that the illegal bird catchers were now extremely nervous and, if they saw anyone near their nets, they would run away quickly.. I am not surprised with punishments like that! Mr Sun returned and his latest bit of magic produced a Red-flanked Bluetail..
Red-flanked Bluetail, Laotieshan, 5 October 2011. These birds are just beginning to arrive at Laotieshan. 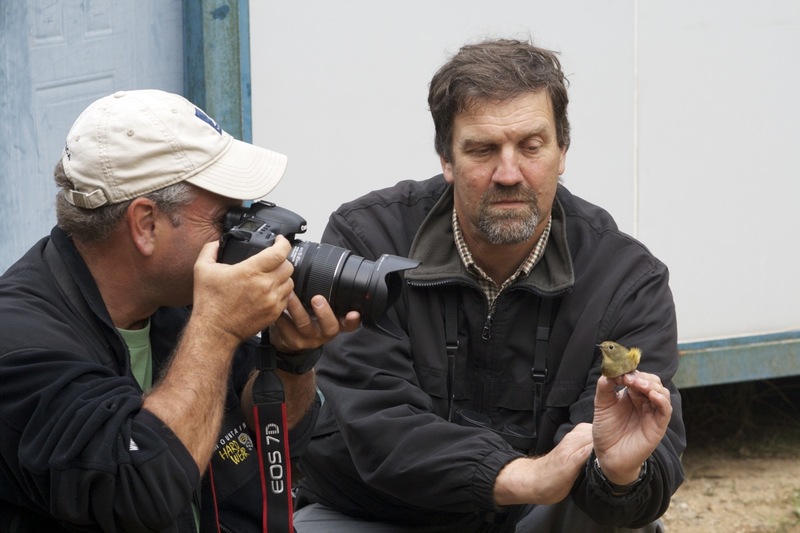 Paul Holt photographs the Red-flanked Bluetail being held by Peter Cawley immediately prior to release. 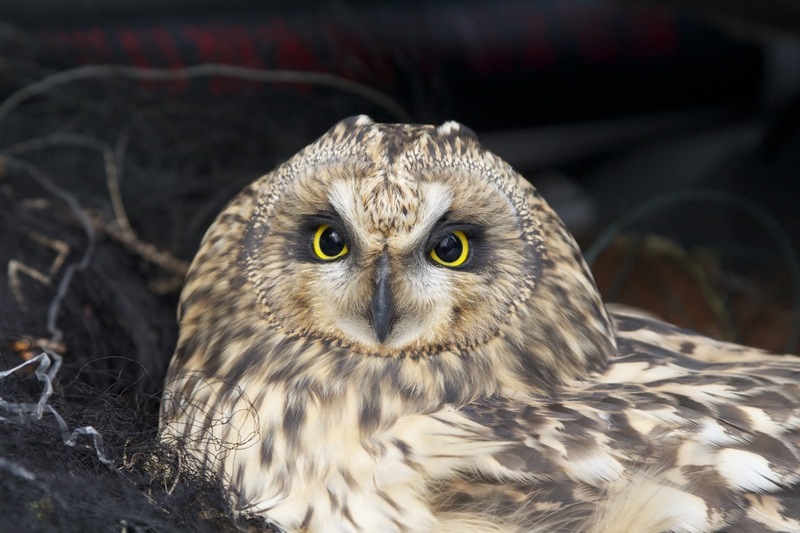 Shortly after, Mr Wang drove up in his 4×4 and opened the boot to reveal a Short-eared Owl he had found in an illegal net.. Unfortunately it had a broken wing, so could not be released.. very sad to see the fate of such a beautiful bird. No doubt many more birds or prey and passerines suffer a similar fate every autumn in the hills around this special site. Short-eared Owl. This bird was recovered from an illegal mist net. The net was destroyed by the wardens but it was too late for this particular bird. As the early morning migration slowed, Peter and I took the opportunity to hike up the hill to a raptor watchpoint above the ringing station. Mr Zhang showed us the way and, after a steep ascent lasting around 40 minutes, we emerged on the ridge to a spectacular view of the hills. 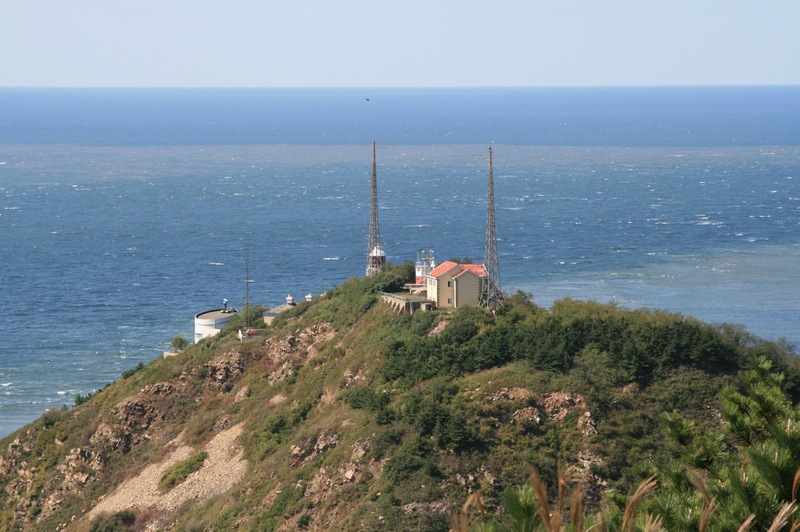 The lighthouse could be seen to the south-west and, to the east, there was a stunning view of a valley and hills stretching north towards Lushun. In a 90-minute count from here we saw a flock of 28 Black-eared Kites, 4 Goshawks, a Peregrine, at least 30 Amur Falcons, 9 Common Buzzards, 2 Hobbies, a single House Martin sp (probably Northern) and a good passage of around 350 Swallows (75 per cent Red-rumped and 25 per cent Barn). 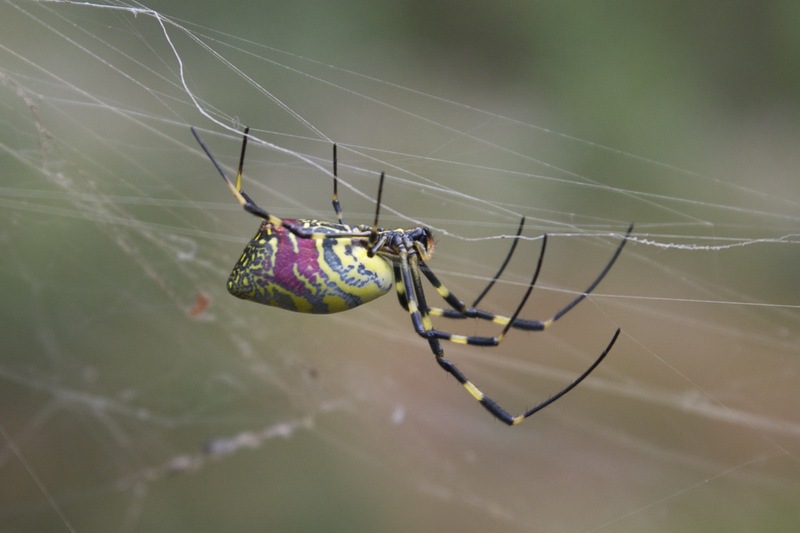 On the walk down we encountered a spectacular spider whose web was reminiscent of one of the mist nets! If I was a small bird I’d be wary of this particular spider..
A stunning spider (unidentified), Laotieshan, 5 October 2011. We did a further round of the nets and birded the woods around the station before saying our goodbyes to the crew. They had made us feel very welcome and we are exremely grateful to Mr Wang, Mr Zhang and Mr Sun for their hospitality, including the fantastic lunch of fried fish and rice – delicious! Peter Cawley, a friend from my old local patch at Winterton-on-Sea in Norfolk, is staying on for a couple of days and will return to Beijing on Friday. I’ll be taking him to Wild Duck Lake at the weekend and he’ll spend a couple of days doing the tourist sites of Beijing before returning to the UK. Paul is going to stay on at Laotieshan for a while yet, building yet more knowledge about this important site. I suspect he will see good numbers of the large eagles in the next few weeks – mostly Greater Spotted but hopefully with more Steppe and possibly an Imperial thrown in. 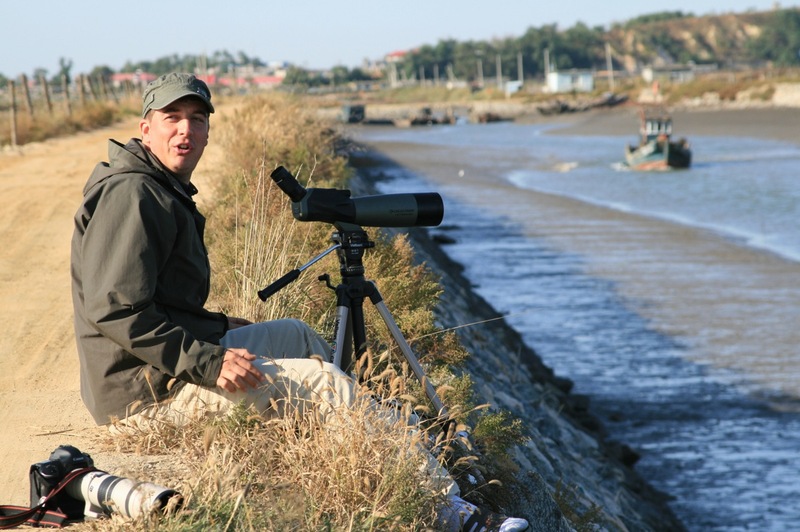 During my short time there we think we have recorded some record numbers of birds in the Chinese context. 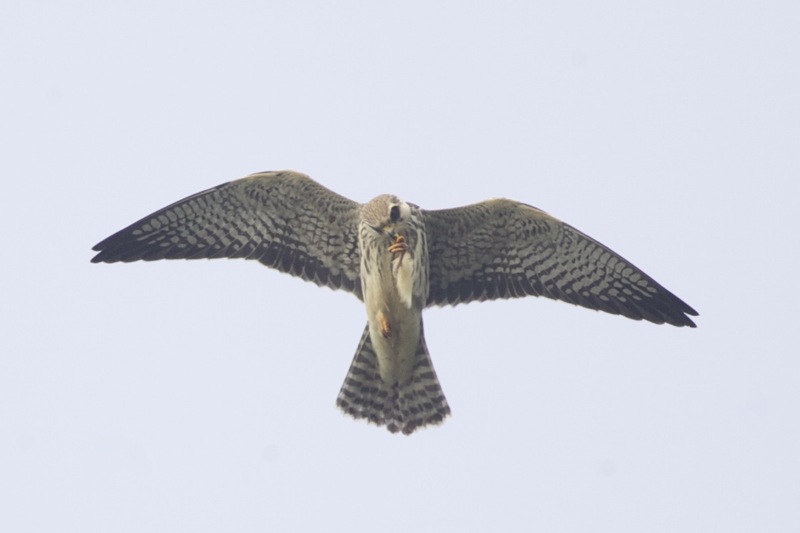 The counts of Ashy Minivets, Amur Falcons and many other birds have been simply outstanding and, in many cases, are much higher than those recorded at the traditional well-watched migration site at Beidaihe. It is clear that Laotieshan is globally significant and the good news is that, due to the proximity of the military and the geographic make-up, it is likely to remain undeveloped. 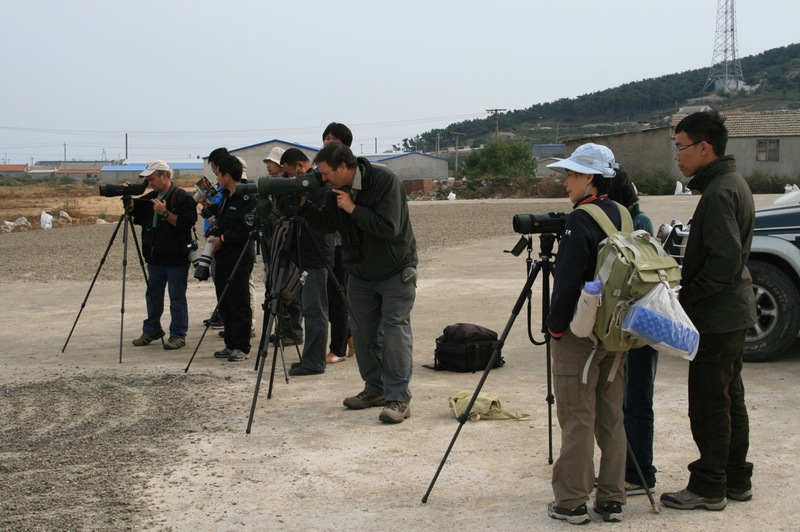 Clearly, access to the best areas is still sensitive but hopefully, in time, this will improve as birding becomes more popular in China and there is a better understanding of the contribution birders can make to the increase in knowledge about China’s birds. Even so, there are still many areas that are accessible now and the birding is simply spectacular. I am sure I will be back! I’ll post some detailed species accounts and a full report soon, once we have collated all the data. There is so much to put down on paper that it may take a while. In the meantime, if I hear about more significant counts from Paul, I will post them here. 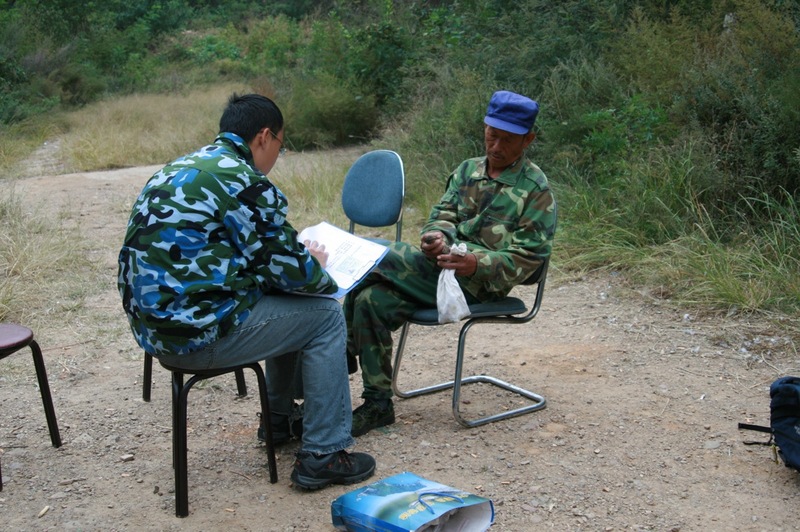 Mr Zhang (left) and Mr Sun ringing and logging a Black-faced Bunting. A motley crew... Paul and I with some members of the Beijing Birdwatching Society and some of the local bird photographers. Taken on the 'helipad' at Laotieshan shortly before Paul and I were asked to leave by the military. 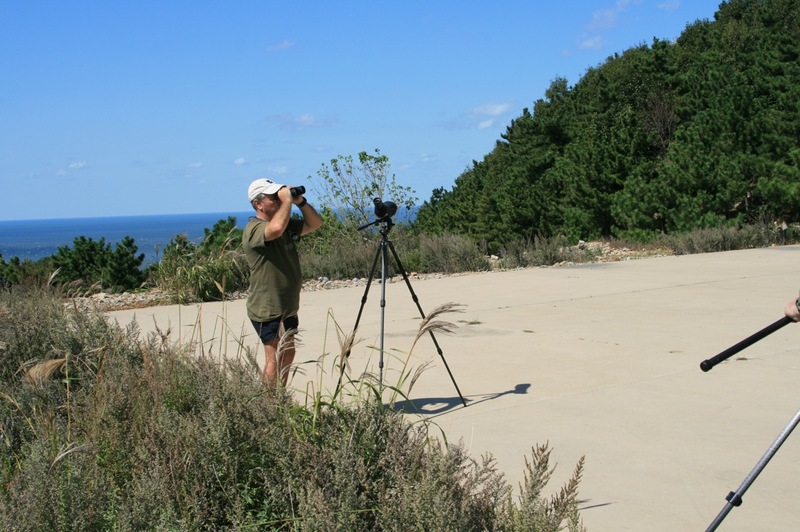 Tom Beeke (Dong Bei) at the wader site north of Pikou.. A top man! Friendly local fishermen at Pikou..
A local couple having their wedding photographs taken along the promenade at Lushun while we watched the local gulls. 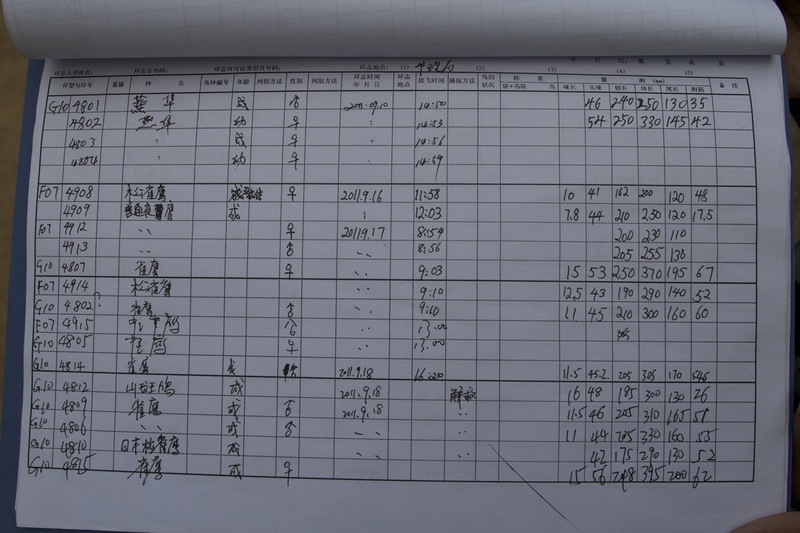 A page from the log at one of the ringing stations at Laotieshan. Amur Falcon (female); one of thousands seen over the last 10 days at Laotieshan, including a flock of over 600 and a count of over 1,100 migrating birds on Wednesday morning in just 90 minutes. Amur Falcon (juvenile), Laotieshan, 5 October 2011. The passage of these birds was a highlight of our stay. Frustration was the word of the day. 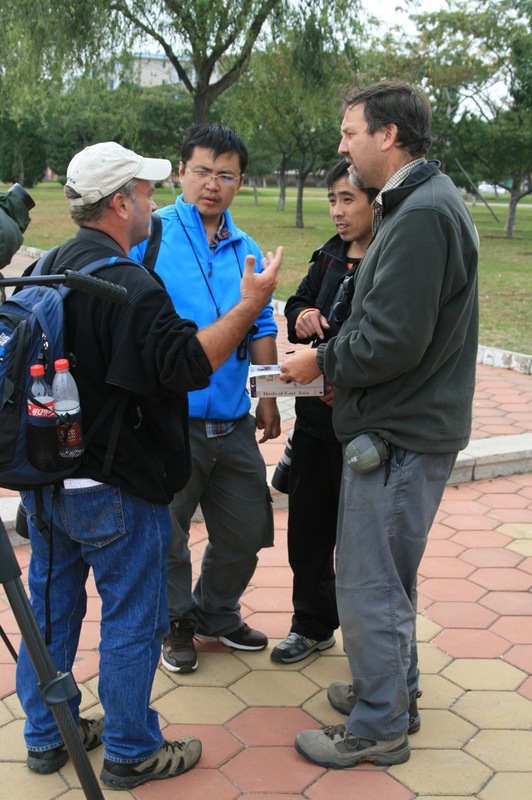 Anyone who has been birding in China will know that frustration is something that you just have to get used to. Today we were chucked off one of the prime viewing areas for raptor migration simply because we were foreigners. The area is close to a military base and so, understandably, it’s a sensitive site. But the irony is that we can see more Chinese military sites from our hotel room (including submarines, frigates and other naval support vessels) than we can from the raptor viewpoint. Nevertheless, at 1100 today we were told in no uncertain terms that we shouldn’t be there and that we would have to leave…. this was after one of the most impressive early morning raptor sessions of our visit so far with a Greater Spotted Eagle at 0630 (! 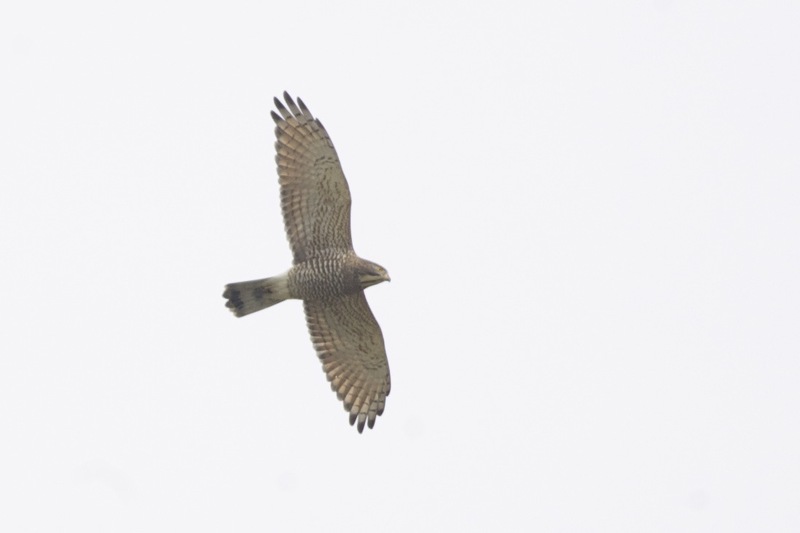 ), Common Buzzards passing at a rate of 250 per hour and a good number of Black-eared Kites, Goshawks and Eurasian Sparrowhawks. Zhong Jia and Tian Yang also told us about a new hotel that had recently opened much nearer to Laotieshan than our base in Lushun. The rooms looked good, the prices reasonable and the bonus is that one can watch raptors from the garden…. in a short visit this afternoon we enjoyed views of 6 Grey-faced Buzzards right overhead plus an astonishing movement of Amur Falcons involving around 600 birds in a single flock… wow. Tomorrow is my last day at Laotieshan. I will have a full day there before making my way to the airport for the short flight back to Beijing. It’s going to be very tough to tear myself away but Peter will be staying until Friday and Paul hopes to stay for several weeks, access permitting. Let’s hope tomorrow is a bumper day! One of today's Grey-faced Buzzards at Laotieshan. It’s been an eventful 2 days. Sunday was spent, as usual, at Laotieshan. The fresh wind was from the north-west and, with the temperature around 10 degrees C at dawn, it felt cold (I had 5 layers on at one point!). After the passerine migration slowed at around 7.30am, Paul decided to walk up to the raptor watchpoint and Peter and I took the track below the lighthouse. 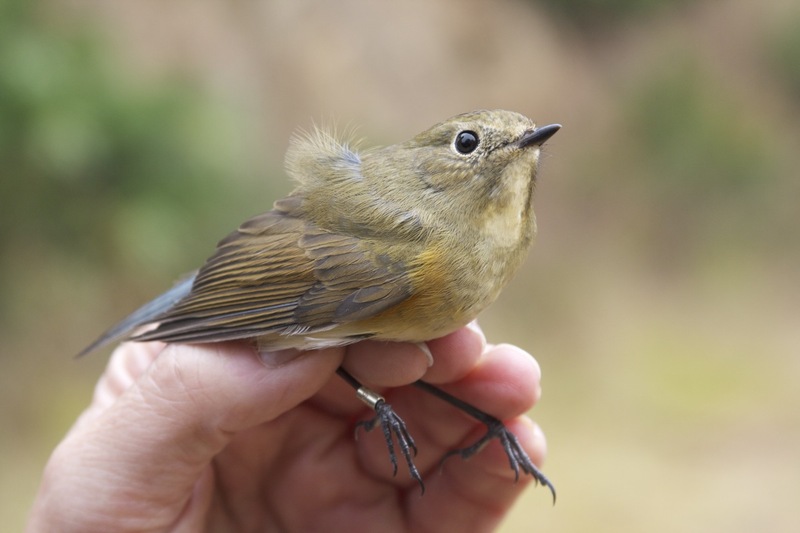 We began well with at least 2 Red-flanked Bluetails, a Mugimaki Flycatcher and an Asian Stubtail. Then, just as we reached the sheltered gully at the bottom of the track, Paul radioed us to say that there was a juvenile Steppe Eagle coming in low along the ridge.. We hurried up the track to a point from which we could view the ridge and enjoyed spectacular views as it slowly made its way inland, battling against the increasing wind.. Steppe Eagle is a scarce bird in eastern China, so it was a very good record. The odd thing is that this eagle occurred during the quietest raptor passage we have experience so far! Migration works in mysterious ways. Sunday afternoon we drove up to Jinshitan to meet up with Tom Beeke for a day of wader watching… After a fabulous meal with Tom’s family (he and his wife, Hannah, are amazing hosts! ), we had a fantastic day up the coast with 108 species seen including such goodies as Blue Rock Thrush, Great Knot, Baillon’s Crake and Chinese Grey Shrike. 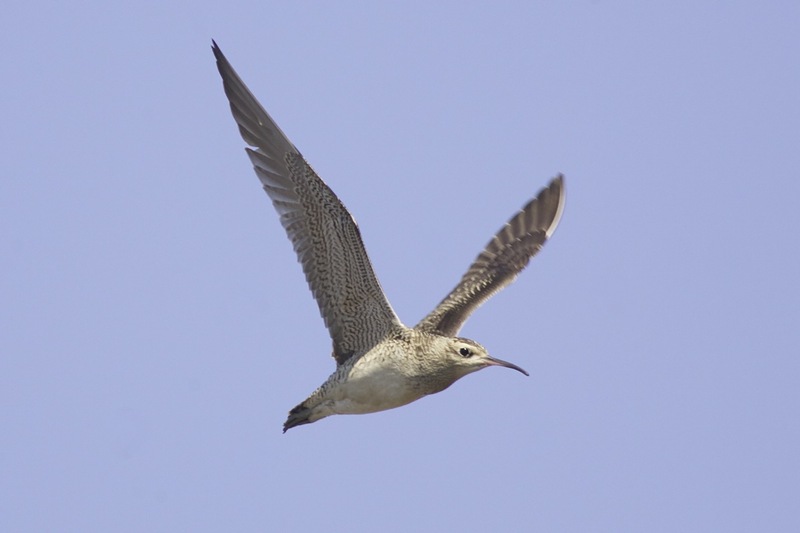 Probably the best bird of the day was a stunning and confiding Little Whimbrel which initially flew in front of the car, causing us to stop rather abruptly on the main road outside Pikou. 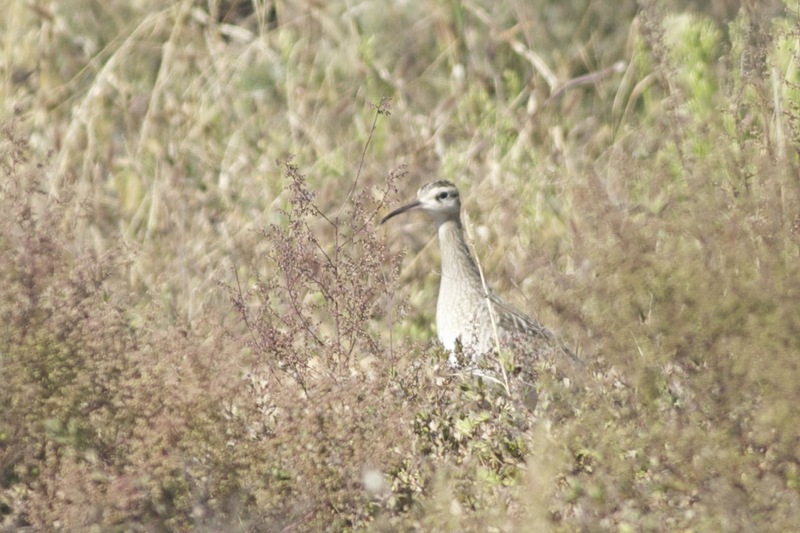 After a brief search, we saw it again in flight and it settled in a narrow patch of rough grass very close to the road. Stunning. After catching up with the waders between Pikou and Zhuanghe (Dunlin, Great Knot, Red Knot, Far Eastern Curlew, Eurasian Curlew, Lesser Sand Plover, Grey Plover, Terek Sandpiper etc) we turned our attention to gulls and it was here that Paul H excelled himself. First he picked out a first winter Glaucous Gull at about a mile range (ok, a slight exaggeration but it was a long way out) and then, within a couple of minutes of that piece of magic, he pulled out a first winter Pallas’s Gull – top class! I only have two more days left at Laotieshan before flying back to Beijing. Peter will stay an extra couple of days and Paul will be staying for a while longer.. it’s going to be hard to wrench myself away from this world-class migration site but I feel very lucky to have been able to experience over a week of incredible birding, particularly as it has been in the company of such distinguished companions. Much colder today with the temperature down to 10 degrees Celsius at 0530. A brisk north-east wind kept it cool all day but, on the plus side, visibility was the best I have seen in China and it was sunny all day. A hawking Grey Nightjar was a nice welcome as we arrived at the car park at dawn and other highlights included 2 Greater Spotted Eagles (one of which we watched migrate out to see towards Shandong Province – something like 60+ kilometres away), over 20 Grey-faced Buzzards and this…..
We think we know what it is but do you? 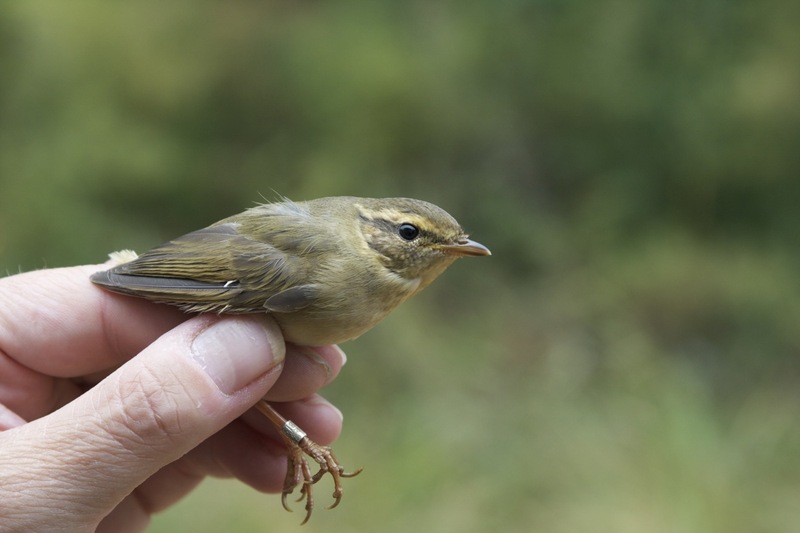 There was a significant fall of phylloscopus warblers today, especially Radde’s and Dusky warblers.. but the number of birds moving was definitely down on the last few days. The forecast for Saturday is for moderate westerlies and mostly clear skies with the temperature increasing slightly. It’ll be interesting to see whether the volume of migrating birds increases again… and with Tom Beeke and his crew arriving for the day tomorrow, we’ll have more pairs of eyes watching the skies.. it promises to be a good day whatever we see. The lighthouse at Laotieshan viewed from the ridge. Thursday started wet, warm and still and ended dry, windy and cold! The weather front passed through overnight but unfortunately the rain started a little early (well before midnight), perhaps meaning that not so many migrants were on the move when the rain hit. 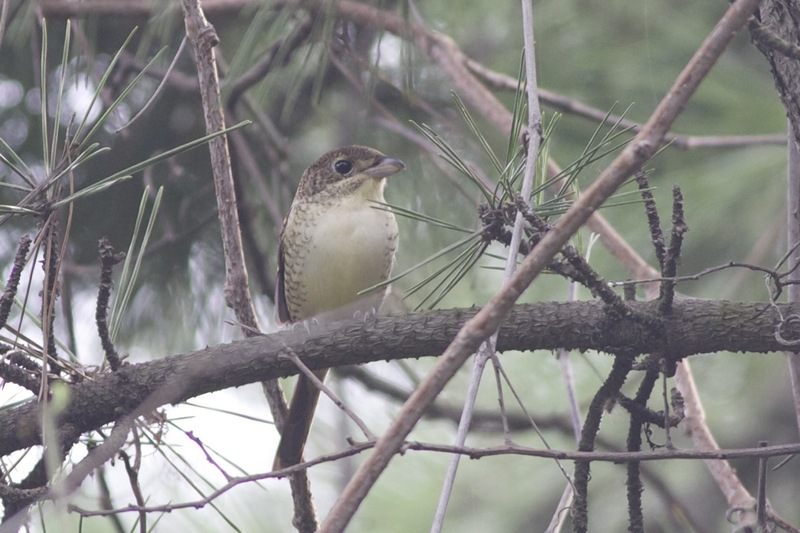 First thing, as the rain petered out, passerine migration was relatively thin by recent standards and, although there had not been a ‘fall’, there were new birds around. Highlights included 2 Baikal Teal that came in off the sea and headed strongly east, a late Eastern Crowned Warbler (on Peter’s most-wanted list), a couple of Yellow-browed Buntings, a single Greater Spotted Eagle, 3 Black Storks and, dramatically, a Eurasian Sparrowhawk attacking a White’s Thrush! At one point the Sparrowhawk grabbed the White’s Thrush with one talon, causing a few feathers to fly, but it couldn’t hold on and the thrush temporarily got away. The sparrowhawk came screaming back but both birds disappeared behind some trees before the final drama was played out, so we’ll never know the outcome. I have to say I feared for the thrush.. the sparrowhawk looked as if it was locked on like a guided missile. Peter’s shrike-finding abilities, honed after many years of discovering Red-backed Shrikes at Winterton, came into their own today when he found a Tiger Shrike along the track below the lighthouse. Tiger Shrikes are scarce birds in this part of the world, so it was a great find. Tiger Shrike, Laotieshan. A quality find by Peter C.
It was another brilliant day and it’s a real privilege to be spending so much time in the field with one of the world’s top birders. I am copying below the list of birds seen on Wednesday, taken from Paul Holt’s master list. Wednesday’s count of Ashy Minivets came in at an astonishing 7,549!